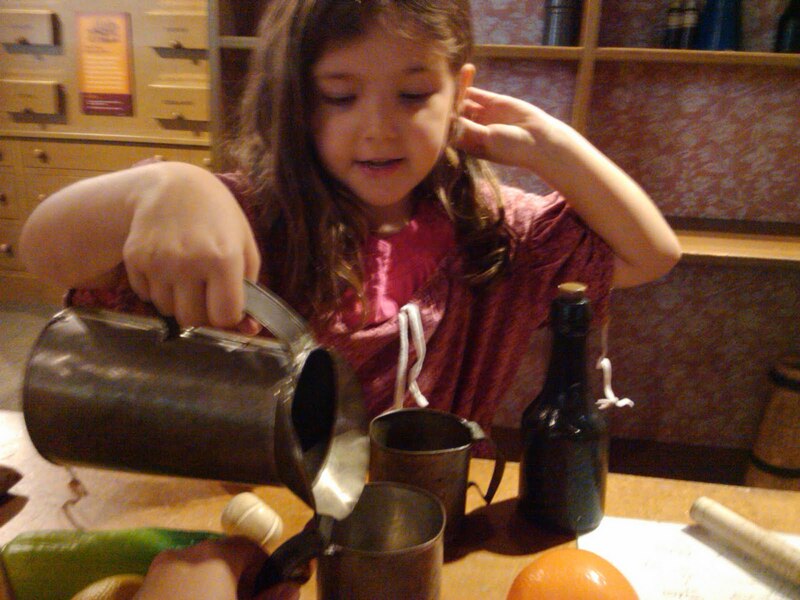 We went to Homeschool Day at Old Sturbridge Village in Sturbridge, Massachusetts. and working behind the counter of a corner store. Old Sturbridge Village is a "living" museum. Everything is done as it was and it's very authentic, from the sounds of the animals in the yards, to the sight of freshly turned earth in a field, to the feel of a stagecoach rushing by, right down to the smell of the manure you step when you walk the dirt roads. The historians dress in costume and they actually do what they are there to teach you about. When you ask the cooper, "How did they bend the wood to shape the barrels?" he will answer you in the first person and begin to show you how he does it. This woman was soaking straw in the hot water she was boiling over her fire and we watched her braid straw to make rope and other hand crafts. This man fired a musket using black powder he poured into the gun from a horn. This little village made the two Little House books we've read aloud come alive. The garden and the smoke house. A barn, it's hayloft and a chicken coop. Norah took a class with other home schoolers on games that children played back in those days. She had fun and came away with several new ways to play, none of which require circuit boards or electricity. Adventure was never from Norah's tiptoes or fingertips. These days, we spend a small fortune on plastic sand and water tables, so that our little ones can enjoy the wonders of God's creation in a controlled environment. But, why don't we just make room in our days for more time to take our children to the creek?